Constance Campion has been practicing medical aesthetics since 1989 when she co-established a non-surgical, medical aesthetic service, within a distinguished plastic, reconstructive and aesthetic surgery practice. Plastic Surgery Associates UK, (PSAUK) has been based at Bupa Cromwell Hospital in London for nearly 25 years. A leading pioneer in skin health restoration and wellness anti-ageing medicine, in 1994 she founded the London Wellness Centre, in Kensington. Constance has extensive experience in all the modern methods of skin health restoration. According to the highly individual needs of each patient, and following an in depth consultation, we apply treatments such as Dermal Fillers, Sculptra, Botox, Platelet-Rich Plasma Therapy (PRP) and Skin Peels. A renowned Analyst in her specialist field of private equity and medical enterprise, she is also a Director of Medico Beauty, a leading UK based company in advanced technology skincare and healthcare science. 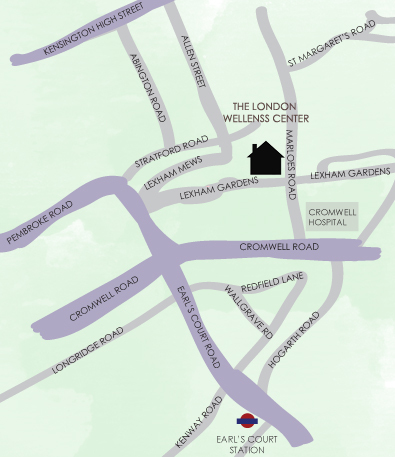 Our clinic is located in the basement of a properly on the corner of Marloes Road and Lexham Gardens. The door to the clinic is found at the end of Lexham Gardens. Nearest Tube is either Earls Court (district, piccadilly or circle) and/or High Street Kensington (circle and district). There are also a number of buses available on High Street Kensington and the Cromwell Road.